I worked this as a present for my husband after we came back from a trip to New Zealand. It is my first effort at Stumpwork (an old form of embroidery, popular in Elizabethan and Jacobean times, in which parts of the work are raised or padded) and I think it isn't bad for a first attempt. More especially as when I did it, I had not found any books on the topic, and had to invent my technique as I went along. 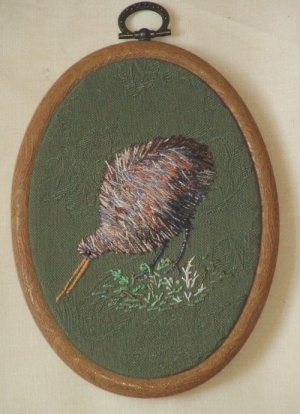 The background material is a green furnishing fabric, and the kiwi's body is slightly padded, and worked in a variegated silk thread that I bought a long time ago, for no other reason than that I liked it. This is a hazard for embroiderers, and I now have a 10-drawer tallboy full of threads bought for that reason alone. In some cases, I do know what I want to do with them, but in many cases I have no idea at all and I'm simply waiting for inspiration to strike!